Whether you are at home or on the go, live streaming Orlando Magic games are now available for free thanks to the FOX Sports app. Simply download the FOX Sports app or go to FOXSportsGO.com, sign in through a participating pay-TV provider, and start live streaming FOX Sports Florida’s broadcast of the Magic game. 1. Download the FOX Sports app for your preferred device. 3. Select FOX Sports Florida and enjoy the game! Will I be able to stream Magic games this season? Yes. If you are a customer of a participating pay-TV provider and receive FOX Sports Florida as a part of your channel line-up, you will be able to stream FOX Sports Florida’s Magic telecasts on the FOX Sports app as part of your video subscription. 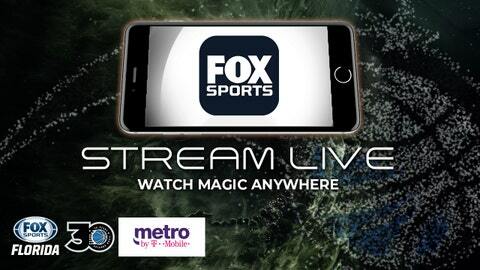 If a Magic game is being televised on FOX Sports Florida, it will also be available on the FOX Sports app. To stream games, users will need to verify their credentials by Signing In with their pay-TV provider’s User ID and Password. There is no additional charge to us the FOX Sports app. The FOX Sports app is an extension of your pay-TV service that you get at home. The FOX Sports app allows viewers to watch on best available screen– at home or on the go. The FOX Sports app isn’t working. What can I do?